Book tickets for our Fun Day event by clicking here! Welcome to Catherines Castles Bouncy Castle Hire! 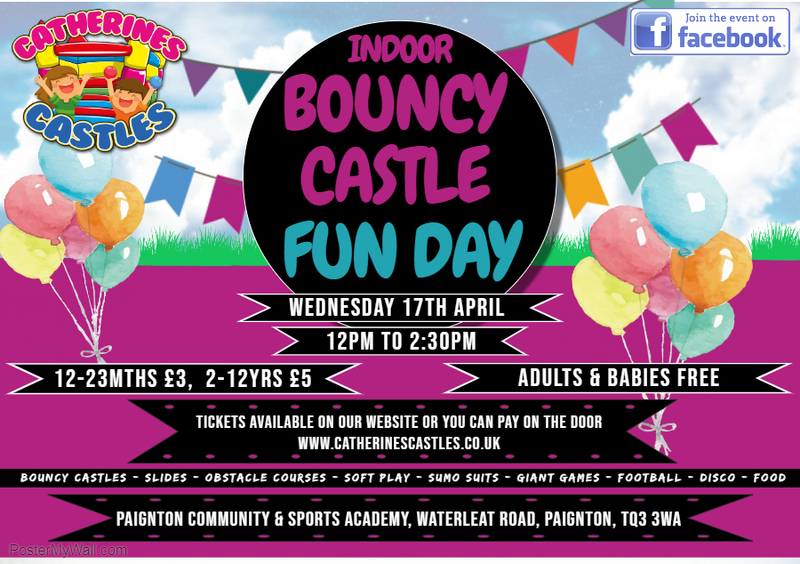 Catherine’s Castles offers bouncy castle hire in Devon including Torquay, Paignton, Brixham, Exeter, Newton Abbott and Dartmouth. We can travel greater distances but would need to quote on delivery costs. Call 01803 326146. We are a family run business that provides both Adult and children’s bouncy castles, obstacle courses and activity centres for all age groups. We will not only offer you the choice of castle/slide you want but you can also specify times for delivery and collection and we will set it up and pack it away for you. No overnight or late pick up fees! No hidden charges, no overnight fees, no late pick up fees! Book a Saturday and get the Friday for free or book a Sunday and get the Monday for free! Book both Saturday and Sunday and have the castle from Friday to Monday for 1.5 times the hire price! Book during the week and get 3 days for the price of 1! Catherines castles deliver free of charge within a 10 mile radius of Torquay. We will travel much further than this but will need to charge £20 for every 10 miles over our free radius. Catherines Castles © 2018. All Rights Reserved.